I am in 7th heaven because today I enjoyed 2 Indonesian conversations!! To be honest, they both were achieved intentionally. Since booking my trip to France, I wondered about my chances of meeting an Indonesian person. This curiosity increased with my nervous first attempts using French. It’s so foreign for me to be overseas and to be unable to communicate smoothly. As soon as I get flustered, Indonesian just pops out of my mouth! 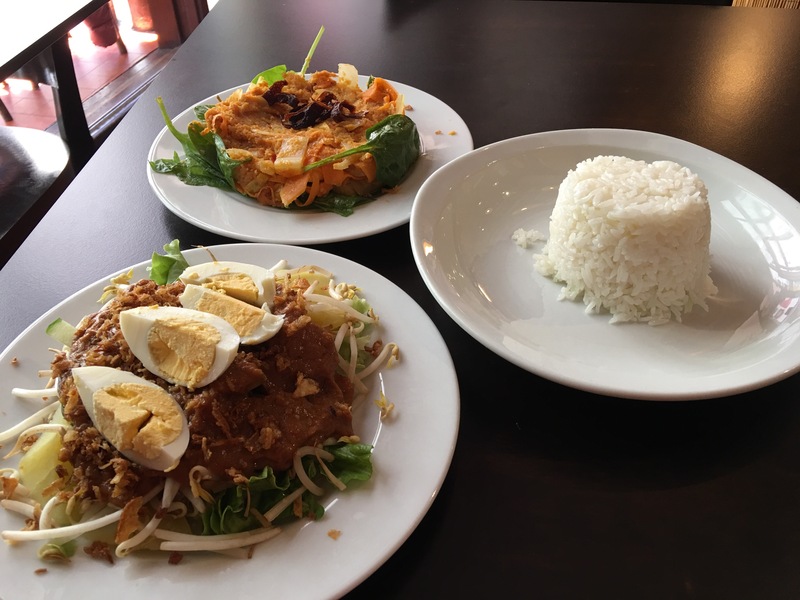 So one of the first things I did on my first jet lagged day in Paris was to google Indonesian restaurants in Paris and was thrilled to discover there are 4 listed on TripAdvisor. Today while traveling on the batobus, I noticed Indonesian writing on a fellow passengers t-shirt. Feeling like a stalker, I wandered over to where he was seated and sat next to the 2 women travelling with him. I introduced myself in Indonesian and when they both did a double take, I enjoyed their reaction!! They were all from Jakarta, although one lives and works in Denmark now! It was so lovely chatting with them both before getting off at the next stop. They happily permitted me to video them introducing themselves to my students!! Their kindness and generosity in providing me with a much appreciated Indonesian language fix will stay with me for a long time. ​Mid afternoon, feeling hungry, I decided to try to locate one of the Indonesian restaurants I’d discovered online. I chose Restaurant Indonesia because it looked the most straight forward to get to from the Batobus circuit. I headed up Rue Saint Michel towards the Luxembourg Gardens and found it easily on a side street. It has a small alfresco area outside – largely smokers – as well as a row of tables inside. The decor is definitely Indonesian although slightly dated. I saw the waiter and spoke to him in Indonesian. He stated matter of a factly that the only languages he can speak are French and English and that the only person here who speaks Indonesian is the chef! I was taken aback with his abrupt response. I found a seat close to the front windows and sat down before asking for the menu which listed a variety of delicious traditional Indonesian dishes including nasi goreng, soto ayam, sate, lumpia and pepes ikan. I ordered urap and gado gado both of which were absolutely delicious even though the vegetables used were unusual. The urap used long thin carrot ribbons and was arranged on a bed of baby spinach but the spices were truly amazing. Half way through my meal, I asked the waiter if he would ask the chef if she had any time to chat with me. He strutted out to the kitchen and relayed my request. The chef came out immediately and we chatted for ages in Indonesian. Sheer bliss!! Her family have lived here in France since 1965, a significant date that fully explains her family’s unspoken backstory. 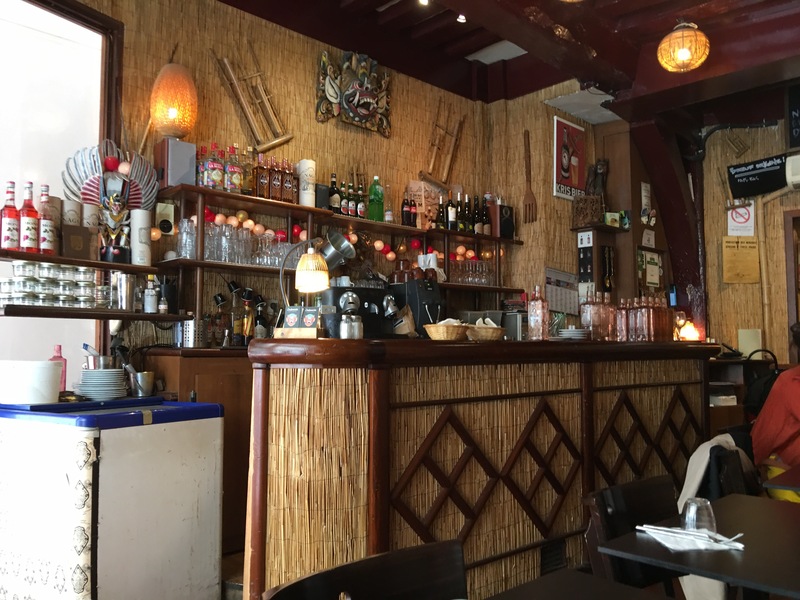 The restaurant, the very first Indonesian restaurant in France, is run by a cooperative and has done so ever since it was opened by her father 35 years ago. All profits are shared equally amongst those on the cooperative and they also happily provide work opportunities for people with minimal experience. The waiter would definitely be a recipient of this. His waiting skills were definitely lacking. The most bizarre thing he did was ignore totally a broken glass jar that fell off the bench onto the floor. He purely walked over it crunching the glass up underfoot each time. I’ve since reflected upon my desire to speak Indonesian so early into my trip and I’m still not exactly sure why I needed it so urgently. It’s funny that I craved an Indonesian conversation rather than an Australian one!! I’ve heard and seen a few Aussies but the idea of starting up a conversation with them is not appealing at all. Was it my way of dealing with culture/ language shock? A self confidence booster? I don’t speak French but I can speak another (not English) language? Whatever the underlying reason, since leaving the restaurant, I felt significantly more comfortable with my lack of French. Which is why, no doubt, that I had a whole conversation at a boulanger all in French on the way back home!! It went something like this: Bonsoir. 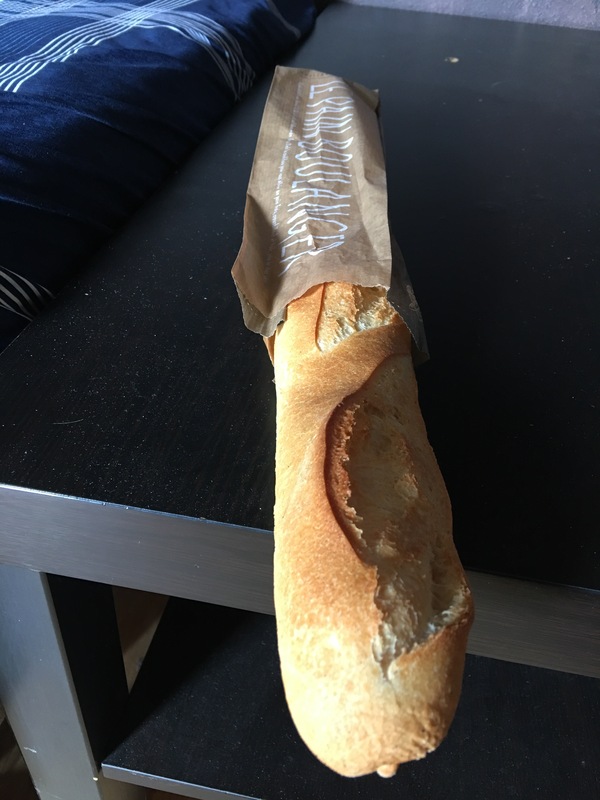 Un baguette s’il vous plaît. Merci. Au revoir. I floated on air all the way back to my Airbnb thanks to the lovely encouraging lady at the boulanger. One of the fantastic things we learned last week from our AIYEP visitors was a hand clapping rhyme that my middle and upper primary students absolutely loved. Farah typed out the tweaked lyrics and I put them up on the smart board. I firstly asked the students to watch Kak Farah, Kak Ricky, Kak Oscar & Kak Rini. They paired up and demonstrated the hand clapping rhyme. After a few repetitions, I then asked for volunteers to come forward and have a go with the ‘kakaks’. The aim was to get as many repetitions of the rhyme as possible before the students did it themselves and this would increase both their confidence and chances of success!! Again, the volunteer students had 2 goes with their mentor kakak’s. The class then looked at the lyrics briefly. This was to purely show them what had been chanted and also to quickly translate to explain most of the hand movements. Students were then asked to choose a partner (student or kakak partner) and be ready to start. We all together chanted satu, dua, tiga, (1,2,3) then began the hand clapping rhyme following along with the kakak’s. There was much hilarity while students had a go for the first time with a partner. Again, for the final time, students were asked to repeat the rhyme with this partner. Then to ramp it up, I asked everyone to change partners, ala Pak Iriantos’ workshop at ASILE. We continued chanting the rhyme and changing partners over and over again, after each run through. It was a great way for students to get repetitions on the rhyme with new partners in a fun way. Have you or your students heard of AIYEP ? Even though AIYEP has been around for 35 years, I have only just learned of it and then only by chance! 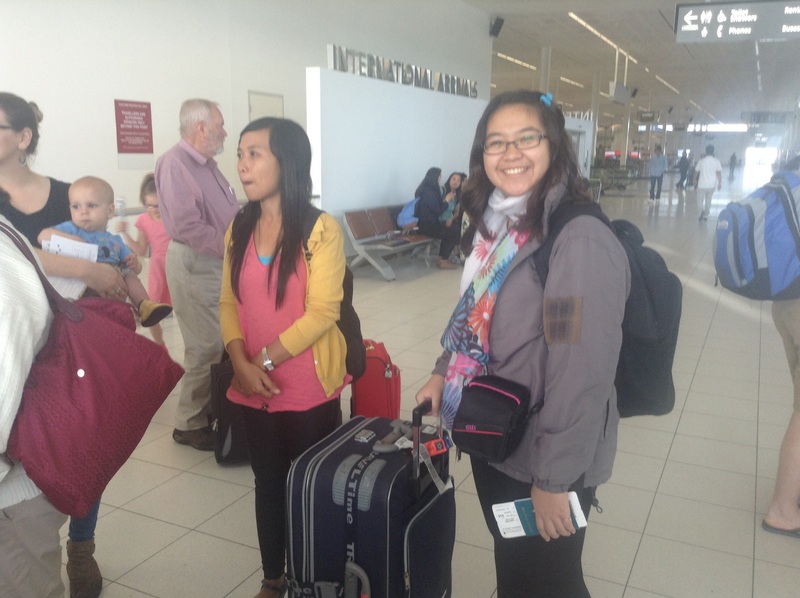 AIYEP (pronounced Ay-yep) is the commonly used acronym for the Australian Indonesian Youth Exchange Program. This program was established in 1981 and is fully supported by the Australian Government (DFAT) and the Indonesian Government (Ministry of Youth Affairs & Sport) and promotes peace and understanding between our two countries. Each year the program is based in a different state/Territory in Australia and in Indonesia it is held in a different province. This year, it is based in South Australia and Sulawesi. The participants, 9 men and 9 women, aged 21-25 years, are chosen from applicants who are either undertaking tertiary studies or working in sectors that will contribute to improving bilateral relationships. Here in SA, we are almost at the end of the first half of the program. 18 Indonesian youths have 3 days left before heading back to Adelaide to meet the 18 Australian youths who will soon be flying to Indonesia for the final part of the program. The Indonesians arrived almost 2 months ago and have enjoyed staying with host families in firstly a city setting and then lastly a rural setting while enjoying work experience placements relevant to their chosen career path. Our region is about to host the farewell ceremony for the Indonesian group who have been here on the Fleurieu Peninsular for just over 2 weeks. 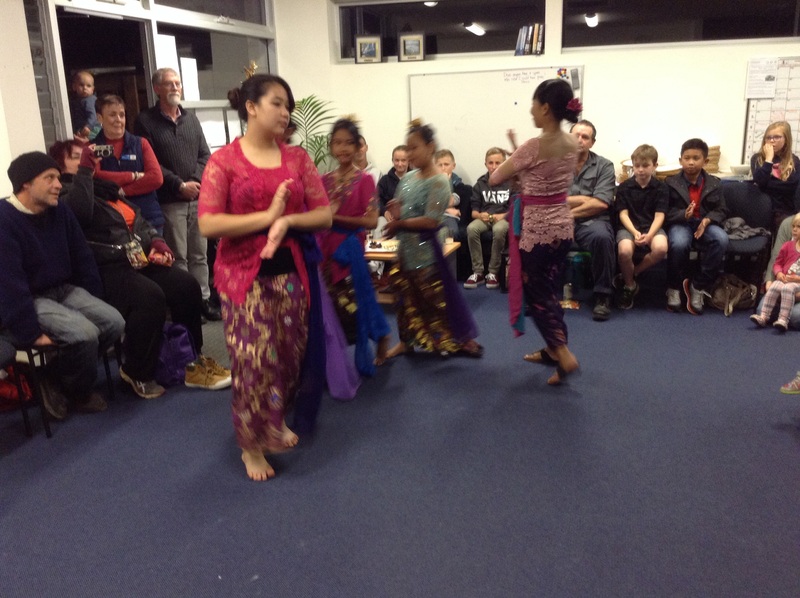 Having 18 Indonesian youths in our community has been such a bonus for our Indonesian language programs. Several local families have offered to be the host families for our visitors and are just loving the opportunity to get acquainted with their temporary adopted son/daughter! Due to Indonesian cultural norms, it is usually difficult for them to address adults by their christian name, so they were encouraged to address their host parents are Mum/Dad. The variations of this have been hilarious. At the Victor Harbor Christmas Pageant last night, I smiled each time I heard someone being addressed as ‘Mom’ or even ‘Daddy’. No matter how many times it is explained that ‘Mom’ is American and not used in Australia, it has continued! Too much exposure to USA TV content? 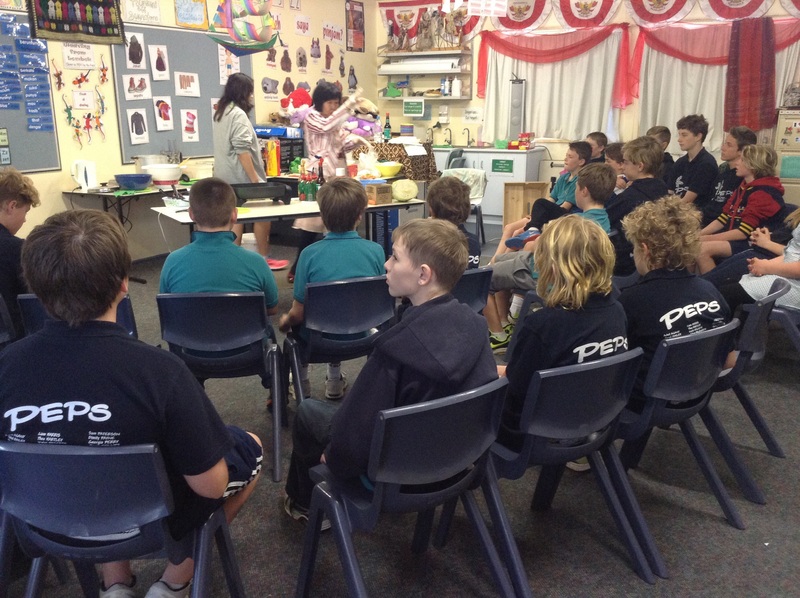 At PEPS, we were fortunate to host 5 for their work placement; 4 in the primary school and one in the kindergarten. The first week was crazy as our inaugural Twilight Pasar Fundraiser was to be held that Friday. 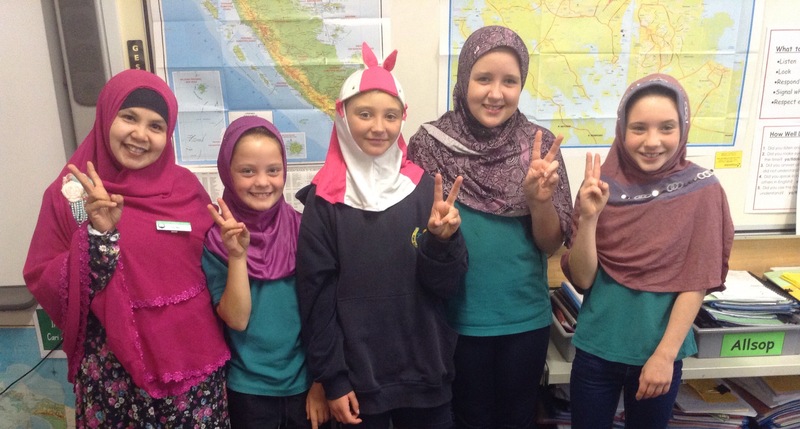 They spent equal time observing classroom teachers and supporting Indonesian lessons. Due to crazy pasar preparations, I wasn’t able to explain in any detail about the pedagogy I’m using in my classroom but thankfully Sharon did at Victor R-7, which led to quite a bit of discussion last night at the Christmas Carol concerts between those from education sectors. Prima is so enthusiastic to learn more about TPRS and use it in her classrooms!! Isn’t that exciting? The AIYEP group has had 4 days each week at their work placement and then each Friday, reconnected as a group and traveled around visiting local schools to perform a selection of cultural dances. 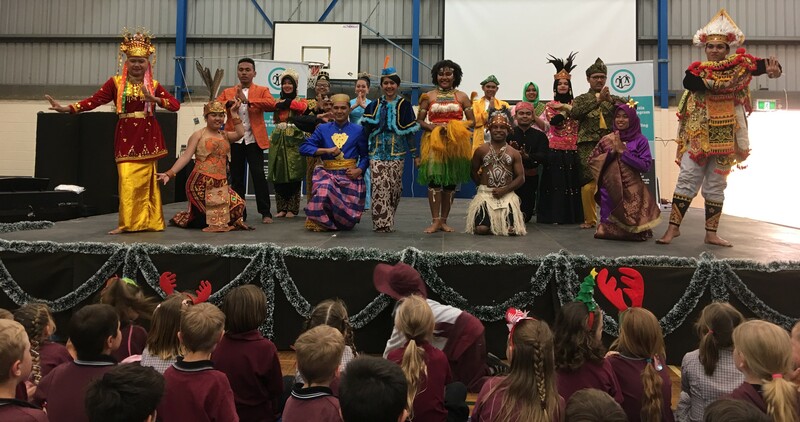 Their first day of their cultural performances on the Fleurieu coincided with the inaugural Twilight Pasar and was easily one of the highlights of our pasar. The costumes and dances were amazing. Each participant wore traditional clothing from their regions: Aceh, Riau, Java, Kalimantan, Ternate, Papua, Sulawesi and Bangka Belitung. Consequently their clothing varied immensely, especially that of the women. Sylvi from Java wore a beautiful cobalt blue sarong and jacket with her hair gathered back for an enormous bun. I’ve only seen her in casual clothes; the transformation was breath taking. Fadilla wore a long dress that she adapted to represent the traditional clothing of Central Sulawesi. The bodice was pink and covered in twinkling gold sequins and she also wore a matching tiara. Her layered black skirt had colourful dangling beads hanging from each layer. Her gold earrings were attached to her ears over her kerudung which strangely looked fantastic! Hannet and Luis from Papua wore grass skirts together with lots of body paint and shell necklaces. Their clothing added such a lovely balance to the group as it is so different from the traditional sarong and kebaya. At PEPS, we had Ricky, Oscar, Farah (Fadilla) and Rini in the primary school and Odah in the kindergarten. During the first week, I presented them with their timetable and sent them off to classes for observations and then in the second week, they were given a choice to continue observing or stay in the Indonesian room. I’m thrilled they chose the latter! Post Pasar, the students were restless, so it was perfect that we had decided to teach traditional children’s games to small groups of students. Oscar chose cublak- cublak suweng, Rini chose bekel, Ricky chose pecah piring and Farah chose lompat karet. Because it was to be a fun week, I asked the students to get into 5 groups and then asked each group which activity they’d like to learn/do. My activity was congklak which most students already know so I was able to get my group going and then walk around taking photos of other groups. Because all but congklak was unfamiliar, there were no disappointed groups. Boys tended to select Oscar & Ricky and it was lovely watching them play simple children’s games and have so much fun. It really was a fantastic way for the students to interact with our visitors. We are going to miss them once they leave our region this Wednesday morning! However the main point of this post is not just to share what we have been doing but also so that you can share this information with your students. Lets hope relations between Indonesia and Australia continue to improve so that programs like this continue to be available for our students in their future. There are so few programs like this (that I know of) that encourage Indonesian Language students to continue with their language learning, offering them an achievable goal as it is a fully funded DFAT program. For more information, see the AIYEP website. After months and months of planning, the group of 5 students and 4 teachers from Petra Berkat School in Denpasar finally arrived!! The final weeks leading up to their arrival was quite frantic at times with last minute tweaking of host families and their timetable. We were so delighted when APBIPA suggested we consider inviting this group of primary students and while their visit is not over yet, it has been very successful so far. Our school hosted Grace, a 14 year old in year 9. She stayed with one of our families as they have a daughter the same age as well as a son in year 5. We also briefly hosted Ibu Yustine, the school director. Her family run the school and thus she was the person with whom we communicated with to organise the various details leading up to the visit. The other 4 students were shared across Victor Primary & Goolwa Primary with the remaining staff. Ibu Oka was based at Goolwa and taught the kecak dance to students there while Ibu Leni was based at Victor and did mask making with the classes she met there. Ibu Yustine and Ariel (the designated photographer) were the only 2 staff members to visit all sites. Ibu Yustine mentioned in her emails that she enjoys cooking with students and was very keen to cook mie goreng while visiting our sites. 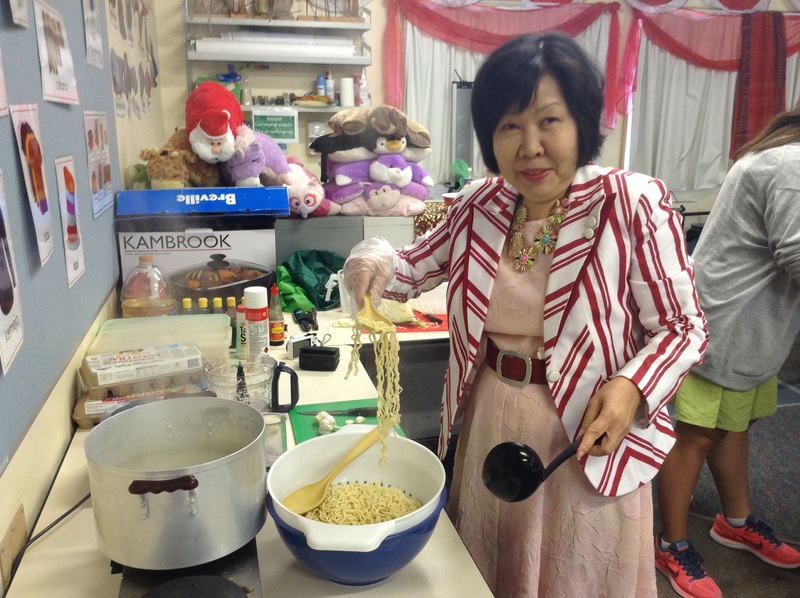 She chose mie goreng because not only is it a well known traditional Indonesian dish but also because it needed to be a recipe that could be cooked and eaten in a 50 minute lesson! Her day at PEPS was full on without any non face to face time. Her only breaks were at recess and lunch! 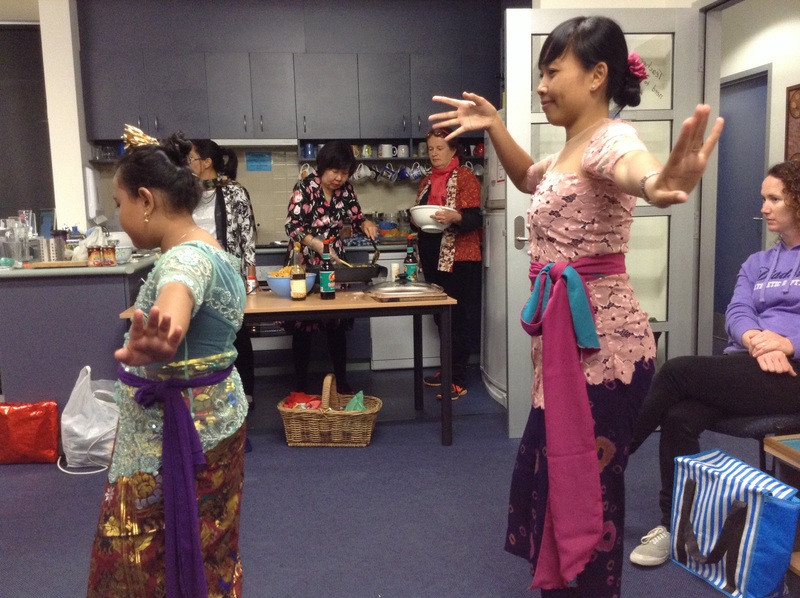 6 lucky classes were delighted to arrive at the Indonesian classroom to discover the chairs arranged around a table covered in ingredients and cooking equipment and standing behind the table were Ibu Yustine and Grace finalising last minute preparations. After the ketua kelas had led the students in a greeting (murid murid, berdiri dan kasih hormat kepada Bu Yustine dan Kak Grace), Ibu Yustine began cooking. Cook the dry noodles till soft. Drain and pour sufficient kecap manis, kecap asin & tomato sauce over to coat the noodles. Beat 5 eggs and fry like scrambled eggs. Remove from pan. fry onion, garlic till cooked. Add grated carrot, finely shredded cabbage and cook. Add egg and stir through. Add noodles and mix thoroughly. Taste and top up with sauces if necessary. Such a simple yet delicious recipe. The students all loved it, even the ones who claimed beforehand that they don’t like egg! I loved that when Ibu Yustine commented in Indonesian about the recipe, my students could largely follow along and when she said something they didn’t understand, the stop sign was raised immediately! It was great. 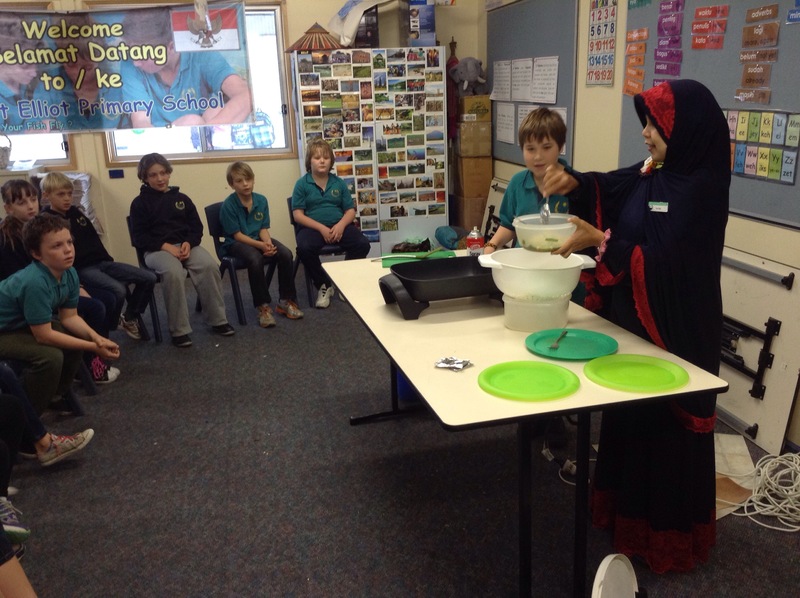 We began by showing students the ingredients and explaining what they were in Indonesian. While kecap manis was a familiar term, kecap asin was not. With the later classes, I broke down asin to ‘us’ & ‘in’ which helped enormously with retention later in the lesson when Ibu Yustine reviewed the ingredients! It made such a difference with recall. When Ibu Yustine added ingredients, she would say, “Kasih kecap manis, kasih kecap asin, kasih saus tomat” etc which was awesome. So lovely that our visitors are largely understood now in the Indonesian classroom unlike before when all cultural lessons were 100% undertaken in English or with English translations. After the school day finished, we headed off to staff meeting where the year 3 class outlined to staff their inquiry into establishing a 4th sports team. It was a perfect demonstration for Ibu Yustine to witness how our students develop inquiry questions, collaborate as a class to research it and then share with staff and students their findings and their recommendations. The 4 students who stayed back after school to present to staff did a great job and represented our school beautifully. Ibu Yustine was very impressed. She was also impressed with the presentation by our principal about listening. She was delighted when he offered to email it out to staff and has since informed me that she would like a copy so that she can share it with her staff at the begining of the new school year!! Straight after staff meeting, staff headed over to the staff room to enjoy a staff family cooking workshop with Ibu Yustine. This time she made nasi goreng. Staff helped with the chopping and slicing before sitting down to watch her cook. This too was delicious and all who participated were pleased they had stayed back to do so. I bet Ibu Yustine slept well that night!! 7 cooking workshops in one day!! All in all she cooked for 5 classes at Victor Primary, 2 at Goolwa and 7 at PEPS. No wonder by Wednesday she had almost lost her voice!! as well as presentations. 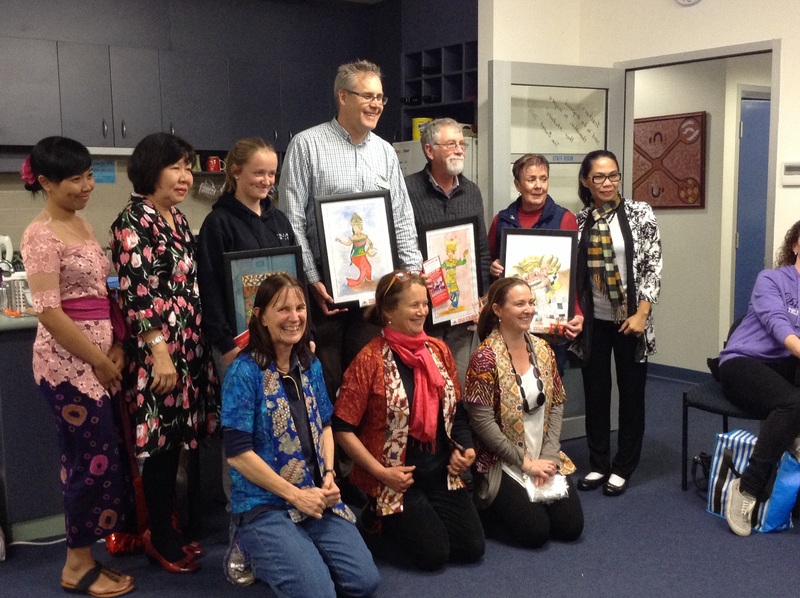 Ibu Yustine presented all schools with art work completed by her students and our principals/ deputy principals reciprocated and presented her with artwork from our sister schools on the APY lands. Sharon, Annie & I were also presented with a beautiful batik jacket each. The cultural evening finsished with an Aussie BBQ as our contribution to the cultural evening! For me, that was the end of my involvement in the visit as I am now flying off to Medan to visit another partner school through the Bridge Project. 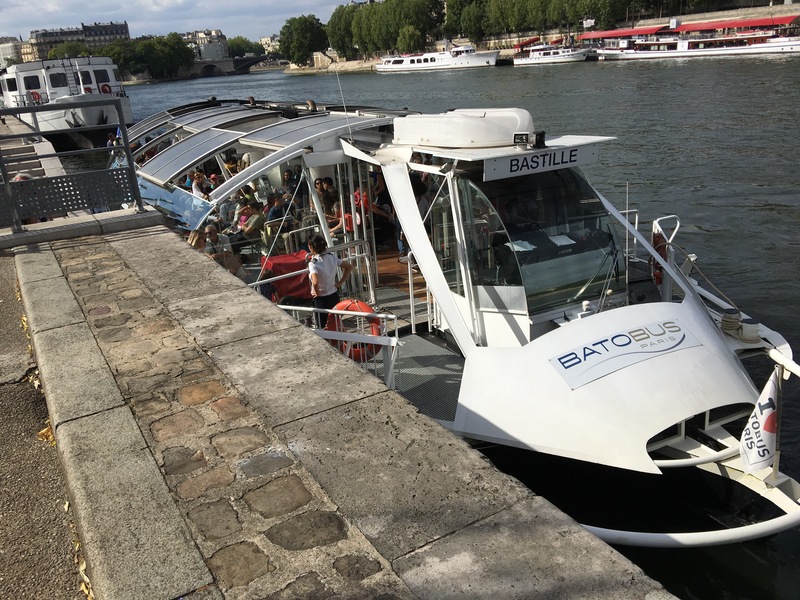 I hope the rest of the visit is successful and that we see Petra Berkat School back on the Fluerieu one day soon! 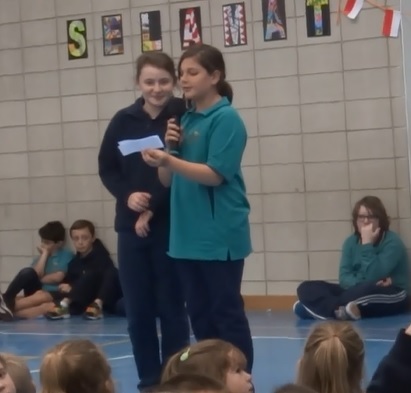 Last Friday, year 5/6 Roberts ran the school assembly. It was amazing! However before I explain in more detail why it was amazing, I have to explain a few things…. These phrases used to be the cornerstone of my language program before I discovered TPRS. These phrases were thus the limit of my student’s fluency because these were they only phrases that were repeated from lesson to lesson, term to term. (Other vocabulary was limited to ‘themes’ and once the theme was finished, the vocabulary was rarely used or covered again.) Margaret has always supported the Indonesian program where possible in her classroom yet lately she has taken it one huge step further. During her release time, she can often been found joining her students in their Indonesian lesson!! I am so touched and impressed for many reasons that she gives up her non face to face time to join us. I really appreciate her feedback on the many aspects of the lesson and love it when we run through the target structures that she has acquired later in the classroom. The assembly went so smoothly and I was immensely proud of the fact that students could conduct an assembly in two languages and that it was 100% comprehensible for all students in the audience. The very first sentence was “Murid-murid, berdiri dan diam untuk Advance Australia Fair.” Immediately the entire assembly of students stood quietly! Wow!! The class teachers, who had no idea of what had been said, were puzzled when the entire student body stood up. Not realising why, class teachers immediately insisted that their students sit down! The students were confused! They had just been asked in Indonesian to stand and now they were being told to sit down!! The sight of the entire school getting to their feet en masse was very moving for me. The students who had spoken the words had used no hand signals, yet the students fully understood it and immediately followed instructions! I also spoke at the assembly to formally welcome Ibu Mia to our school. Once again I was blown away by their comprehension and was so incredibly proud. 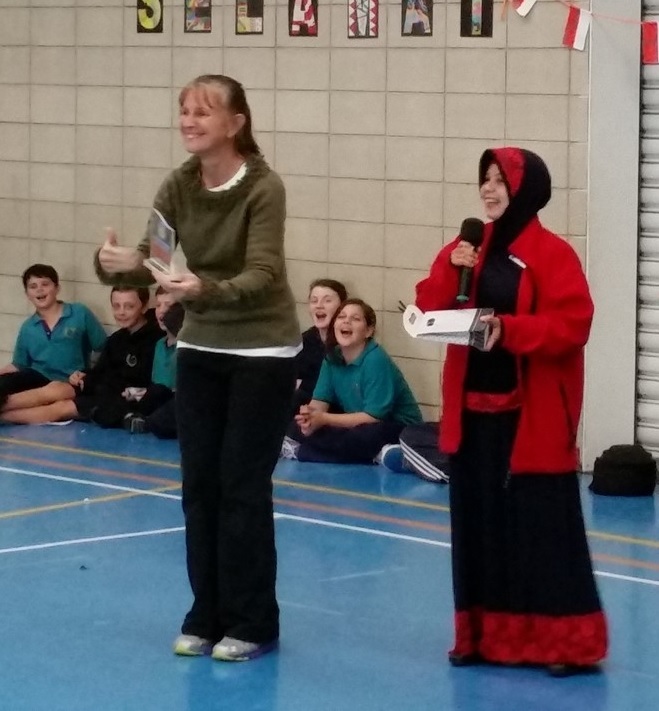 I spoke in Indonesian and when I asked them all, “Paham?” they answered en masse, “Paham!” Ibu MIa then presented a trophy to our principal that her students had made especially for our school. When I held it up to show the students they all agreed: “Astaga!” It blew Ibu Mia away! What an amazing assembly! 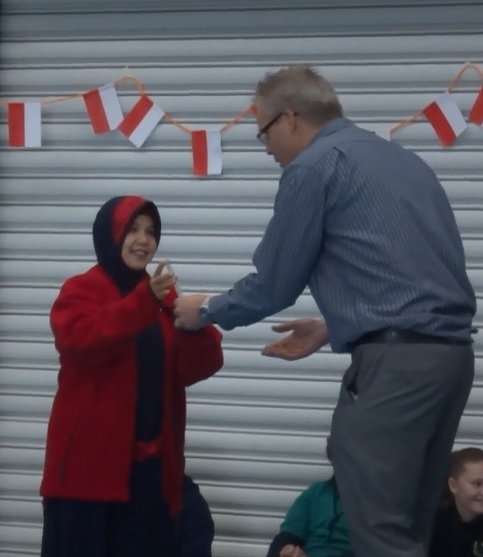 To think that our students now know enough Indonesian to conduct an entire assembly is pretty cool! Congratulations to the year 5/6 class. You have certainly set the standard now and I really hope that the next class who runs the assembly is also keen to conduct it bilingually! This week my students are enjoying a chance to interact with and learn from Ibu Mia, an Indonesian high school English teacher from Batam, Kepulauan Riau. She will be in our area for 3 weeks, spending a week at each of our schools. Her visit has been entirely coordinated by Pak Nyoman from APBIPA and we are so, so fortunate to able to particiapte in this program. Through APBIPA, we have hosted teachers from Sumbawa, Bali, Sumatra, Jakarta, Kalimantan, Bandung and now Batam. What a fantastic way for my students to experience the diversity of Indonesia. Even though it is a tiny island, the population is roughly similar to Adelaide; 1 million. It is only 35 minutes from Singapore by ferry and Ibu Mia has often taken her sons to Singapore for a day trip! There are 1500 students and 90 teachers at her school, SMK 1 Batam. Batam was only founded in the 70’s and then developed in the 80’s as a centre for free trade. Batam has a good selection of high class hotels, one of which is a restored cruise ship! There are 7 domestic harbors and 2 international harbors in Batam. Batam has a huge industrial sector. Ibu Mia lives in Batam Centre. There is a ‘Welcome to Batam” sign which is exactly like the Hollywood sign in California. Batam’s skyline resembles any develped city’s skyline. Multi-story buildings and freeways. This visit has been so enjoyable for me for a variety of reasons. Usually I teach as per usual and my visitor co-teaches i.e., assists with modeling pronunciation, extra facts etc. However this time, the focus of the lessons this week has been Ibu Mia, thus being a cultural brain break for all of us. While lessons largely reverted back to the 90% English/10% Indonesian ratio, it was so interesting and informative that it wasn’t an issue and we still managed to where possible incorporate the target structures for this term and students enjoyed plenty of opportunity to demonstrate their growing ability to speak in Indonesian with many classestotally impressing Ibu Mia! So exciting!! I couldn’t help pointing out to the older classes, that the level of communication we used with Ibu Mia was far above that which we have used with any previous visitor. How do you put on a jilbab? Do you sleep in your jilbab? How do you get your hair cut if you can’t take it off in public? What happens if someone comes to your door that is not family and you are not wearing your jilbab? The most amazing thing about all the questions was that they were all respectful! Not one student made a negative comments about any aspect of Islam. I am so proud of my students. Ibu Mia was so relieved. 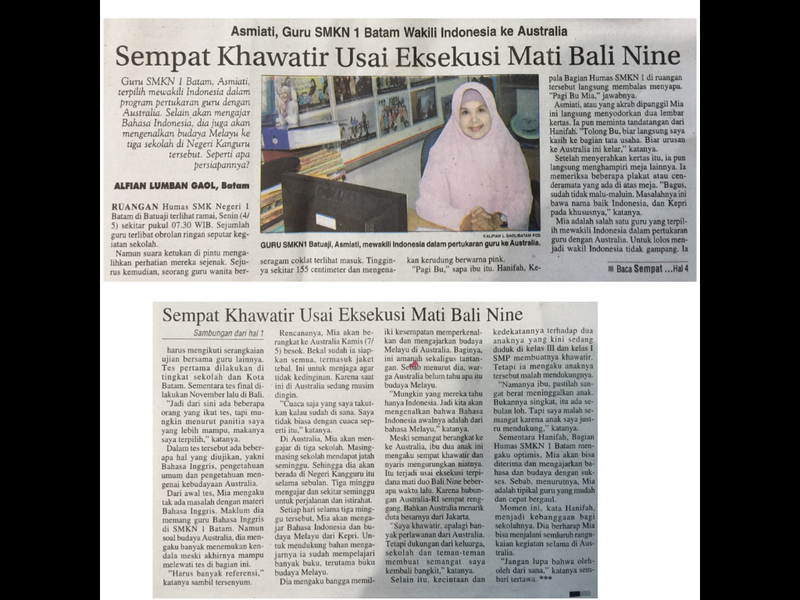 She showed me an article from her local paper for which the headline which roughly means: Ibu Mia is a ittle bit worried about visiting Australia On The Heels of The Bali NIne Executions. Her friends all warned her that Australians would harrass her because of the executions and that it was a terrible time to visit Australia. Many also suggested she reconsider wearing a jilbab in Australia or at least wear a smaller one. Thankfully she did not listen to their advice!! At our school and in our local community she experienced exactly what I experienced while traveling in Indonesia amidst the telephone spying scandal: most of the hullaballoo is political and hyped up by the media. The general public are largely cynical consequently and thus when a visiting national from that country is polite and personable (as Ibu Ma definitely is), it dissolves any animosity one may have for their nation and is brilliant for breaking down the stereotypes that events such as these perpetuate. Siapa mau menjadi assistan Ibu Mia? Kasih Ibu Mia telur. Apa telur? Ya, telur egg!! Jade, kasih Ibu Mia dua telur. Berapa telur? Berapa murid di kelas ini? Ayo, Menghitung! They would then count with her while she tricked them by going fast sometimes and slow sometimes. Garamnya (apa garam? Ya, garam salt) Garamnya terlalu besar, terlalu kecil atau pas? Siapa mau makan mie goreng telur pakai saus? Terima kasih IIbu Mia. PEPS will miss you! I was blown away with the total and utterly mesmorised attention of the classes from year 2 right up to year 7! Even when the Sprite finished, students insisted I refill the bottle with water, so we could continue. Even with water, students were still highly engaged and following the dialogue closely. It not only hooked the actors, but hooked the other students too as they decided whether Ella would give Jessie a drink of Sprite and if not Jessie, then who would be given a small drink of Sprite. It is definitely worth taking the time to organise props for lessons with all year levels. Not only do students beg for repetitions, but it is so much more fun too for everyone. I have never laughed so much with students!! 2. Public Holiday Pitfalls – Usually I begin my week with the year 4’s and they are a great bunch of students to ‘trial’ my middle/upper lessons with. They give me the opportunity to fine tune my plan before facing the year 6/7’s the following day. While I enjoyed my first Easter long weekend in many years (our Ed Dept usually cleverly incorporates them into our mid semester break), I forgot to keep this in mind and consequently yesterday’s lesson with one of the year 6/7 classes was a disaster. With this class I need to be one step ahead of them. Maybe Trashball or something similar would have been a better plan for a challenging class in week 11..
3. Trial by Error – A exhausting yet necessary aspect of teaching and a fact that I (and any learner) needs to philosphically and practically accept. I’ve read that it can take up to 2-3 years for a teacher to acquire competency using TCI methodology. This is what keeps me going! There are many fantastic blogs and websites full of TCI brilliant ideas and suggestions. Gleaning through them all to find ideas suitable for teaching primary students and then trialling it requires a huge step out of my comfort zone and so much energy. Yet each step is an important and integral aspect of the entire journey. I must keep reminding myself to continue plodding steadily along the TCI path and not to expect too much too soon! 4. Dehydration – TCI requires so much teacher talk and I have discovered that I am so much more dehydrated at the end of my days than I was ever before. I have tried to keep up my fluids over the day but haven’t been successful consistently with this yet. I get so engrossed in the lesson that I totally forget to stay hydrated. The most successful stategy I had was finishing my 750ml drink bottle at the beginning of recess and lunch on my way to the staff room but lately even that has fallen by the wayside. Any suggestions gratefully accepted! 5. The Importance of Developing A Personal Learning Networks (PLN) – The core of my PLN consists of Annie & Sharon, my Indonesian colleagues who teach in nearby schools, together with Catharina, our mentor who teaches French in New Jersey. The middle layer of my PLN consists of teachers who teach Indonesian and have been following this blog or my tweets. Their input has been invaluable and I have truly appreciated their comments and feedback. While there are common aspects between different languages, there are also certain aspects that are unique and therefore those who teach and speak Indonesian have that special eye through which to understand my reflections and experiences. They too are are coming to grips with our new Indonesian Curriculum to be implemented fully in 2016, another valuable persepctive. The outer layer of my PLN consists of all the TCI language teachers who post on their own blogs or on websites like Ben Slavic’s. There is definitely a gap for me between the middle and outer layers purely because most of the teachers in the outer layer are secondary teachers and none of them teach Indonesian. Yet, they are still a major and important part of my PLN as they have such a wealth of knoweldge and experience that I am truly in awe of them. Without this special group of people, my first term of TCI could have finished so differently. Whenever I felt like I had hit a brick wall and I couldn’t see where to go next, someone would be there to encourage and help. Annie and Sharon have been awesome and once again I am so fortunate to work so closely with 2 teachers who readily joined me on this journey. Our frequent Friday meetings were invaluable opportunities to share lessons that worked well and thus give us each the inspiration and encouragement to continue. Our Skype sessions too, with Catharina have been incredible. Each time we all took copious notes. It is so amazing to have the opportunity to speak with a junior primary teacher about TCI and how to apply it with very young students. Now that term 1 has almost finished, we are really looking forward to our next Skype call with Catharina. While we usually only speak for an hour, each call is jam packed full of awesome suggestions and information. She truly is an amazing and inspirational teacher to have in my PLN and a huge thankyou must go to Ben Slavic for initially suggesting it! 6. Lesson Planning – On looking back through my lesson plans, I have definitely learned that while it is good to have a few brain breaks up my sleeve, it is also important to keep my planning simple. My initial lesson plans from the first weeks were very long and were a great example of over plannning which is a good way to start! I tried to cover everything at first and then realised that it was not only unrealistic but also pushing the students too quickly. Narrow and deep is the TCI catch cry for a very good reason and this is what underpins the success of TCI over the methodologies I used previously. 7. Patience is a Virtue – When reading blog posts written by other teachers who also use TCI, I have to keep reminding myself that comparing my students (or their lesson outcomes) with theirs is pointless. My students & i have only just started so it is natural that we can’t yet have impromptu detailed conversation that are 100% comprehensible. It is of greater importance that we start with the Indonesian version of the super list of verbs sourced from frequency lists and accept that initial discussions will be be very basic. 8. Humour – At a point about mid-term, I reached a point where everything gelled. Suddenly I relaxed and started to enjoy myself with the students. At that point I realised that it was the first time I have ever laughed so much WITH my year 7 students. Previously, any hilarity got out of hand and ended with me having great difficulty bringing them back on track without loosing that sense of connection. Yet with TCI, we laugh together at the ridiculous scenarios the students suggest and then act out. Not only do students have fun, call out and be totally silly, but because it is all in Indonesian, it is amazing and all students are totally mesmorised and engaged thus keeping it manageable! 9. Tight Timelines have Vanished – Previously, my term outline was tightly planned and in order for me to achieve my term outcomes, every lesson was precious and heaven help anyone who interfered with my schedule!! Taking sick leave was avoided and any additional offered non contact time was reluctantly refused because my planning didn’t have much flexibility. This has all blown away with TCI as everything is based upon student aquisition which is a huge unknown. Once we know what the target structures will be, out planning will focus on that until we, the teacher, deem the students ready to progress to the next step. Consequently, with our upcomiing APBIPA visitor, Bu Mia, I feel far more relaxed and am really looking forward to her time in our school. Students will be able to experience a cultural lesson with her and this will also give them impromptu and authentic opportunities to practise and demonstrate their acquired Indonesian to date. I am so looking forward to term 2 and having the opportunity to apply all that I have discovered. I also hope that my reflections give other Indonesian teachers the encouragement to consider trialing aspects of TCI in their classrooms. Last year, I dabbled just by experimenting with a few activities that sounded interesting and that is how I urge you to start too. While I am nowhere close to TCI mastery, I am nontheless, very happy to help any Indonesian language teacher if you would like to discover more about TCI. Ask away and if I don’t know the answer,, someone from my amazing PLN will certainly help! !